I happened to take a look at some of the products a popular Spanish-teacher catalog w as promoting. As someone who enjoys not only the language, but the culture of the Spanish-speaking world I was embarrassed by what I have seen in my profession. The number of stereotypical imaging used on the products was considerable. I can’t even tell you how many maracas, chile peppers, burritos, and tacos that I came across. Now some of you may find these images “cute” and think I’m just being grumpy (I did see a lot of that reaction to this image on pinterest). Maybe these items are targeted for an elementary audience, where “cute” is appropriate, but I’ve seen teachers in secondary levels using these types of images as well. And I’ll be honest, I’ve been guilty of this too. We want to “spice up” a worksheet or document with clipart and without many options we choose something arbitrary, such as a piñata. However, if this is what we expose our students to, we are perpetrating these stereotypes. I want my students to see these countries for the beautiful things that they offer. I don’t want them to associate the Spanish language with a taco. Every taco is not created equal. And if your students think Taco Bell is representative of Mexico, then we are failing them. Share your thoughts below. Update: We’d like to highlight some clipart that teachers can use that are culturally rich. Check out these amazing sets of clipart for Spanish class including Powerpoint backgrounds that respect the culture! And for further reading on the harmfulness of stereotypical images, read this article. This entry was posted in Culture, Discussion/Methodology and tagged stereotypes. Bookmark the permalink. Fabulous! Thank you for writing what I have ways thought! This is so incredibly true. 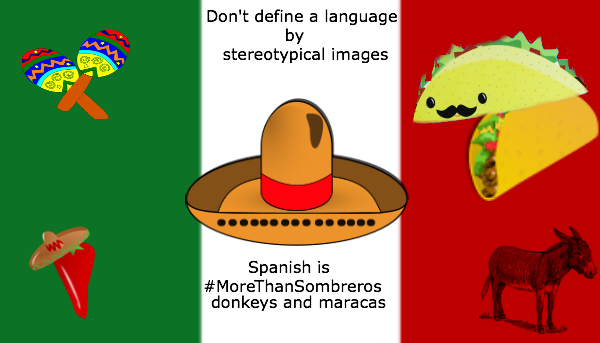 Many of these stereotypical images are a distorted image of a very tiny facet of the Hispanic world. I’m so sick of seeing professional educators perpetuate those stereotypes. It’s unprofessional, closed-minded, and inexcusable. I would love a ready-made poster like the one with the above message about stereotypes. Right in line with what I’ve been thinking. Send us an email at spanishplans@gmail.com and we’ll see what we can do. Great post! With 20 countries worth of culture, you’d think we’d find more than sombreros, piñatas, and tacos to use as icons. It is so easy to use real art, architecture, festivals, and nature as inspiration for cultural exploration. There is a wealth of all those things in the Spanish speaking world. You’re absolutely right! I would love to see inexpensive, authentic “artifacts” (crafts, toys, dolls in native costumes, etc.) from many other countries in that catalog, as well as at large foreign language trade shows. We could use them as talking points in our lessons. It’s our job as Spanish teachers to enlighten students that “Spanish” or “Hispanic” does not necessarily mean Mexican or Puerto Rican. We shouldn’t be promoting these stereotypes. Especially considering our wages have gone down in real dollars in the last 20 years and the fact that most of us cannot travel as much as we would like. There is a big company that films Spanish educational videos always portraying a “gringo” in the videos with a “senorita” showing him around a Spanish speaking country. I’ve always wondered why, to be fair, there was never a “gringa” being shown around by a “chico” in these type of educational videos, to be fair. It smacks of stereotyping. They always use the word “gringo” in their videos, as well, which I find offensive, and again, stereotyping to both cultures, in my opinion. Agree 100%! Thanks for your perspective!